Real estate investment trusts (REITs) are naturally suited for this purpose. They must, as per their status pay most of their profits to us as dividends. This tax requirement let’s us play landlord from the convenience of our brokerage accounts! Plus we can cherry pick our real estate buys to focus on those that increase their dividends consistently over time. These stocks have wonderful “built in” capital appreciation potential because their stock prices rise as their dividends climb. We won’t get this price growth from a mere ETF, however. While many REITs do raise their payouts year after year, there are other REITs that find themselves overleveraged and forced to slash their dividends. Which means we must select our REITs smartly and carefully. In fairness, retail REIT Washington Prime (WPG) started with a weak hand. Simon Property (SPG) packed many of its second- and third-tier mall assets into the company and spun it off in 2014. (At the time, Fitch Ratings even warned against the bargaining power of second-tier malls associated to spinoffs like Washington Prime’s.) WPG then bought up Glimcher Realty Trust for $4.3 billion in early 2015 to make up the current entity. 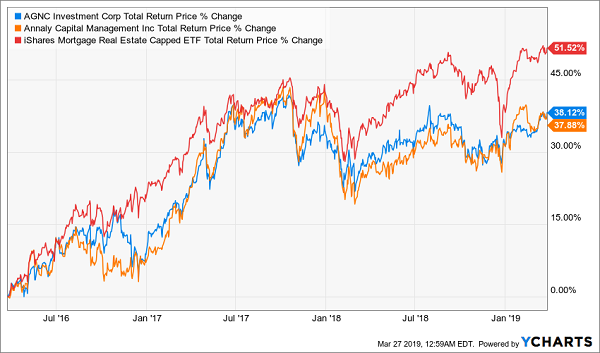 While the company has rebounded with the rest of the REIT market in 2019, it’s not because it’s doing much right operationally. Full-year adjusted funds from operations (FFO, an important REIT profitability measure) dipped 7.4% in 2018. That’s bad. What’s worse is how Washington Prime closed out the year–with a 13.6% dip in AFFO, to 38 cents per share. One of the “sunnier” parts of the report was that comparable net operating income for its Tier 1 and Open Air assets were “practically flat, down only 0.3%” … after they backed out $7 million in impact from Toys R Us’ bankruptcy and some capex. 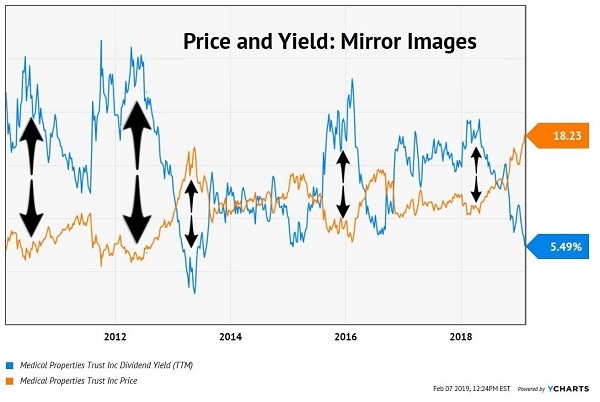 Considering these issues, as well as the warning signal flashing from its barely-not-junk debt rating, Washington Prime is not a reclamation story investors can feel good about yet–18% yield or not. Mortgage REIT Annaly Capital Management (NLY) has had significant issues in the past because of its heavy concentration in fixed-rate securities. The problem? 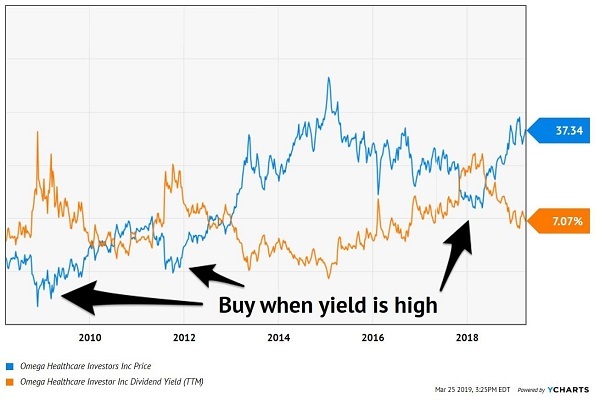 When rates rise, the rates on those securities look increasingly stale, and their prices decline as investors jump into higher-rate securities. Back in 2004-06, this hacked away at profits, causing Annaly to hack away at its dividend. NLY remains heavily invested in fixed-rates, at 93% of the portfolio (that’s growing; it was 90% just a year ago). It’s not as much of a problem now that the Federal Reserve has pushed the “pause” button on interest rates, though it has hampered the company over the past few years. But Annaly investors still have plenty to grumble about. Fourth-quarter earnings were a doozy. The report was peppered with issues such as an uptick in leverage from 6.6-to-1 at the end of 2017 to 7.0-to-1 at the end of last year, thinner net interest margins (1.34%), a decline in book value per share (From $11.34 to $9.39). But the biggest problem was the most important number: core earnings per share, which declined 13.3% to 26 cents per share. The yield is nice, but the cash flows behind it aren’t. 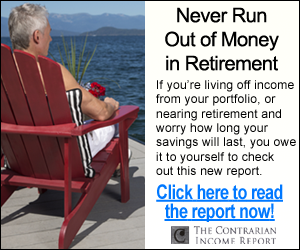 I love the instant diversification investors can reap from buying into funds. But I prefer actively managed closed-end funds (CEFs) over index funds in part because in some market industries, fund managers act like bouncers, keeping out the riff-raff and letting the few attractive players in. 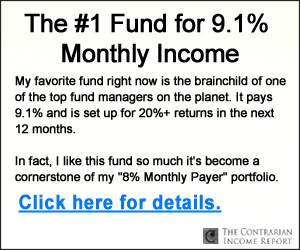 A good example of how index funds get it wrong? The iShares Mortgage Real Estate ETF (REM)–a portfolio of about 35 mREITs that are weighted by market cap. In other words, the bigger they are, the more they affect the fund’s performance. The problem? 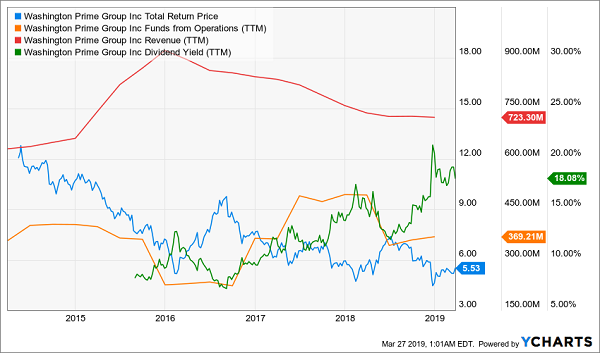 The two 800-pound gorillas of the mortgage REIT space – Annaly Capital and AGNC Investment (AGNC) – make up almost 30% of the portfolio and have dragged it down with their underperformance. The mREIT industry is a difficult one with more losers than winners, making quality stock selection vital, moreso than with other areas of the market. You see the same thing in international real estate, where ETFs such as the SPDR Dow Jones Global Real Estate ETF (RWO, 3.5% yield) and SPDR Dow Jones International Real Estate ETF (RWX, 4.9%), where you would be far better cherry-picking the best REITs to buy at any given moment. It’s actually easier to “time” REIT stocks than most investors think. Thanks to their generous yields we can simply buy the safest payouts when we are able to secure the most dividends for our dollar. With its yield near its all-time lows, it made sense to sell (and book our 109% total returns). Even the sleepy high yield space can experience mild bouts of irrational exuberance! Fortunately there are investments with more price upside that will actually give us a raise to boot (up to 7.5% dividends).